What does a 47-year-old widow with kids at home do? 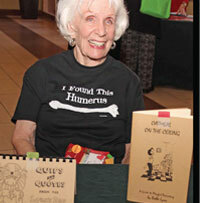 Long-time AATH member Bobbe Lyon advises, you find some kind of purpose to keep you moving forward and, “You try your chops at something!” One of those “somethings” became therapeutic humor, including AATH. In 1984, Bobbe completed her BA degree in Journalism and taught at the community college level. She created her professional company, Laughing Lyon, Ltd., loving the alliteration. Following her natural love for laughter, she designed a course titled, “Laughing Matters,” and marketed it “for older ladies and displaced homemakers.” She didn’t expect much, but was astonished when 25 people showed up! She soon completed a Master’s degree in Counseling and treated herself to Joel Goodman’s Humor Project in Saratoga Springs, New York, in 1988. While there, a woman named Alison (Crane, the founder of the organization that became AATH) was handing out cards with “this wonderful bibliography of humor resources,” Bobbe recalls. Intrigued, she kept the card handy until, five years later, she attended her first AATH conference. She knew she had found “her people” at AATH. In recounting her engagement in therapeutic humor, she told of the time she approached the priest who directed a retreat center near her home about possibly teaching a course there. He asked if she had ever considered teaching creative writing for an elderhostel. She responded, “Are elders really hostile?” Well, she soon discovered what elderhostels were and for the next twenty years, she taught “The Many Faces of Humor” at that facility and at other elderhostels in three states! She joined National Speakers Association to build credentials. And the advice of everyone in that organization included, “You have to have a book.” Her first, a recipe book, she titled, Humor-Us-Soups from Funny Bones: Souper recipes for survival. Once in-hand, a friend held a soup party, where she invited friends to come hear “quips and quotes from the Lyon’s Den.” She loved making people laugh! Bobbe has been an important member of AATH for decades, including being one of the infamous “Pink Ladies” who entertained conference attendees and even organized a conference or two! 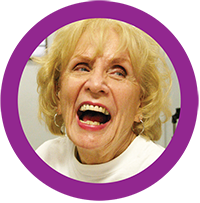 When asked what keeps her returning to AATH, even now at age 82, she responded quickly, “I was getting rusty and lazy and I wanted to get revitalized.” As she gets revitalized from AATH, our members get revitalized from Bobbe’s ever-youthful outlook on life. Thanks, Bobbe!